"Sure, the treasure around the sleeping dragon looked like it would be easy to get. At least the Rogue was convinced that sneaking in and grabbing an armload of loot would be a cinch... things were going well until the Barbarian knocked over a stack of golden platters and the Dragon awoke. Needless to say, he was not too happy to see us going through his treasure. The first to run was the Rogue, as usual - hide in the shadows is her motto - but no Paladin runs when a fight is at hand. So I hefted my sword and attacked, expecting to see lots of help, minus the Rogue of course. Instead, as I was bringing down my sword, I saw out of the corner of my eye the Wizard And the Dwarf edging toward the door... it is going to be one of those days." 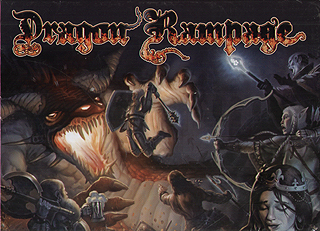 Dragon Rampage, a competitive fantasy game by Richard Launius, is a strategic dice game for 3 to 5 players. Each player takes the role of one of the adventurers (all with different abilities) and the goal is to score the most points at the end of the game by fighting against, or running from (or some combination of the two) the dragon you just woke up and tally up the treasure and gold you obtain in the dungeon. Try not to draw the dragon's attention as you make your way, and note that your fellow adventures may hinder (or aid) you in your strategy and that the final scoring changes depending on how the game ends, so watch your step!